A lot of people started to use Debit cards nowadays. Currently there are 2 commonly used card in Malaysia which is the Public Bank Visa Electron & Ambank NexG prepaid Credit Card. 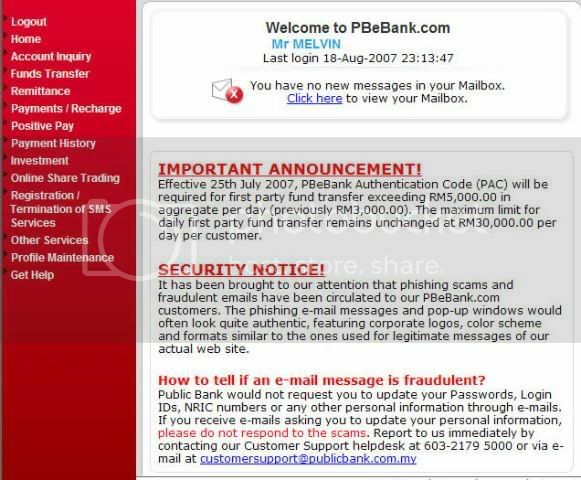 I’ve decided to make this guide because a lot of people PMed me in Lowyat Forum on How to reload their Public Bank Visa Electron card. It will be easier for me to ask them refer to this post instead of repeating the steps all over again. Anyway, to reload your Visa Electron via Internet Banking, you need to have at least 1 Savings or Current Account linked to your Internet Banking account before you proceed to the next step. Step 3. 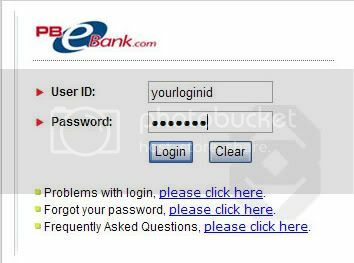 After logging on, you’ll be brought to you internet banking account page. Step 4. Notice the menu on the left. There is a link for Payment/Recharge. Click on it. Step 5. You’ll notice another sets of links available to you. Under the Credit/Debit Card payment category, click To Own Accounts. Step 7. After clicking Next, you will see a confirmation page. Make sure all the details is correct before before clicking Confirm. Else, click back if you need to change anything. Final step. Upon confirming your transfer, you’ll be shown the status of the transfer. If the transaction is accepted, Congratz! You’ve successfully reload your Debit Card. If there’s anything that you don’t understand, feel free to leave a question of comment. Cheers! hg ni biaq betoi dedahkn no akaun simpanan dgn no kad kredit… x takut kena ‘curi’ka??? 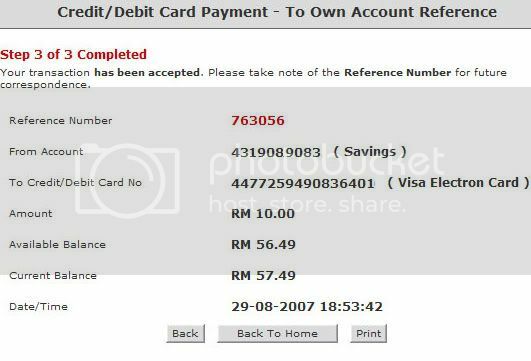 Beside using online method, any method to reload money to PB visa electron card? Can it be done by cash at counter? THank You. I have a PBB visa electron debit card but no PBB savings/current account. I can confirm that using the debit card on a PBB ATM, option to enable online banking is not there. So I guess it can’t be done stand alone: you NEED to have a savings/current account at PB first. I verified this yesterday. can i pay through maybank2u? this is my first log in, but i have no idea to go through. It just shown how to log in and not the first log in, no instruction also, so how should i transfer my credit? I have just received my PB debit card. Can you please tell me how to use the cash deposit machine to reload my card? # Ben: did you verify this with the bank? Cos as far as I know, as long you have the card + the PIN, use it at the ATM machine to get the PBEonline banking PIN. # jabbar : Yes, you can. It’s similar to paying credit card from other bank thru Maybank2u. # ting: you need to apply for the PBEonline banking PIN first, then login as per normal. I don’t know whats wrong with my Public Bank Visa Electron Card, the customer services told me that I can’t link the card to my pbb saving account but I can register for PBB day2day card. I wonder if you guys able to link your visa electron card to saving account. I don’t feels like wasting my time again on registering a new card. Any ideas are welcome.